Just Like Human Skin, This Plastic Sheet Can Sense And Heal : All Tech Considered Human skin has properties that are hard to mimic, but a Stanford engineer is working to create a type of artificial skin that can sense, heal and generate its own power. Zhenan Bao, a chemical engineer at Stanford University, is working to invent an artificial skin from plastic that can sense, heal and power itself. The thin plastic sheets are made with built-in pressure sensors. Artificial limbs have come a long way since the days of peg legs and hooks for hands. But one thing most of these prosthetics lack is a sense of touch. Zhenan Bao intends to change that. Bao is a chemical engineer at Stanford University. Her long-term goal is to make an artificial skin out of plastic that can do most — if not all — of the things real skin can do. Skin is pretty remarkable stuff. It keeps dangerous bacteria and germs out and our innards in. It's flexible, it can sense when we touch things and it can heal itself when cut. Bao has to make a pretty remarkable material if she's going to mimic all that — and she's getting there. She recently took me on a tour of her lab in Shriram Center for Bioengineering and Chemical Engineering. "This is where we make some of the devices," says Bao as we enter one of her lab spaces. We're standing next to a large sealed chamber with a clear window. There are long black gloves sticking straight out from the bottom of the box as if there were someone inside trying to reach out. But it's actually just the air pressure in the box. You use these gloves to reach into the box. This "nitrogen box" is where new devices are tested before they're exposed to the air. Bao builds her devices from a plastic she has specially designed that mimics the electrical properties of silicon, the element semiconductor chips are made from. She takes a small, clear square of plastic from a container on her desk. 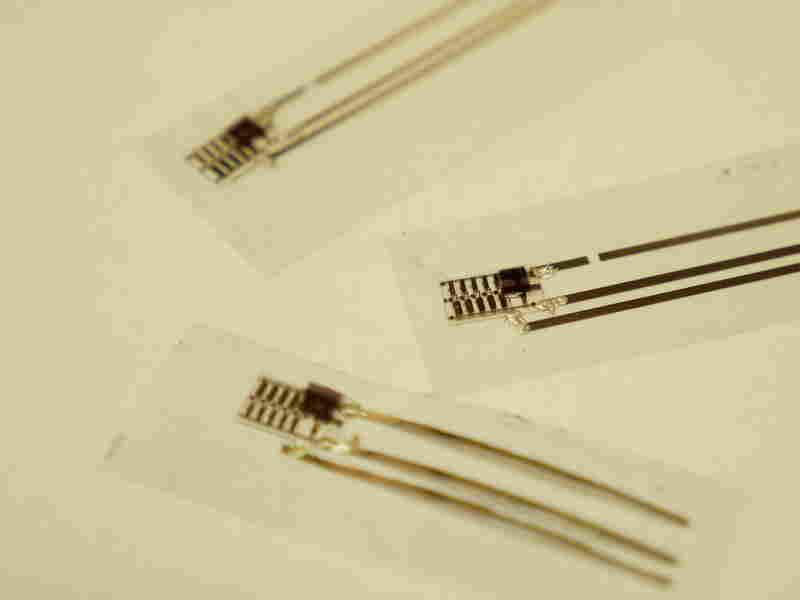 It's about the thickness of a piece of skin and it contains a nano-scale pressure sensor. A pressure sensor is sandwiched inside layers of plastic. It senses the pressure unleashed on the plastic and changes its electrical properties. It looks to me like an ordinary piece of plastic. You can't really see it, but there's a pressure sensor sandwiched inside layers of plastic. It changes its electrical properties depending on how hard you press on it. But it's not enough to just make a plastic with a built-in pressure sensor. You need to build an electrical circuit into the plastic that can relay what the pressure sensor is sensing. Bao shows me how they've done that. "So you can see there are some really fine lines," she says. "These are electrodes that can turn the touch signal into electrical pulses." Ultimately, the idea is to feed those electrical impulses to nerve bundles that can transmit them to the brain. Skin will heal if you scratch it. To mimic that property, Bao and her colleagues made a plastic that repairs itself when it's torn. 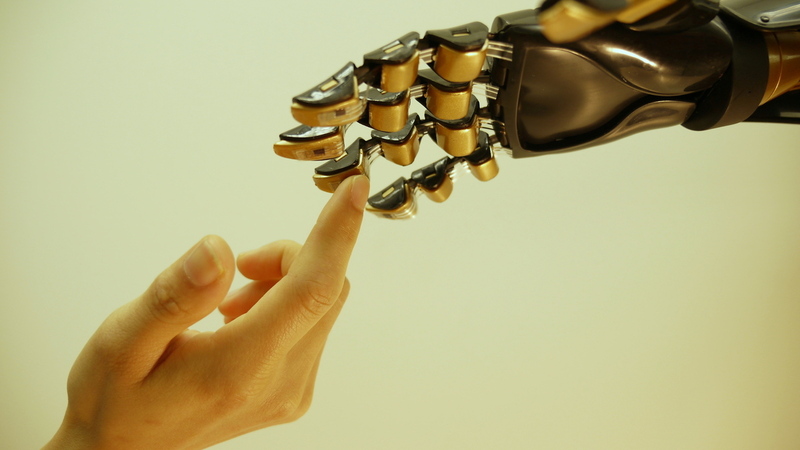 An Artificial Limb Can Bring Hope — But Who's Going To Make It? "Depends on how we design the molecules," she says. "Some can repair very quickly, within a minute, some take hours or days to recover." Making a flexible, stretchable plastic was also a problem at first. "But now we also have a new version that can stretch to eight times its original length," Bao says. Another problem Bao and her colleagues are working to crack is how to power their artificial skin. One idea is to use light. Postdoctoral scholar Xiaodan Gu shows me a polymer that can turn light into electricity. This also doesn't look too different from an ordinary plastic wrap. He holds a piece of the plastic out so I can see it. "Those shiny things are electrodes, and on the top side you can see these tinted color ... they absorb light and transfer the light into the electricity," he says. Gu hopes to be able to use a version of his polymer to manufacture cheaper solar panels. Bao says there'll be other spinoffs as her lab works to build plastics with a variety of electrical properties. She has already started a company that plans to sell a version of her plastic for touch screens. "Our really long term goal is to use this to help patient(s) who lost their limb(s) to recover their sense of touch," Bao says. Bao says there is still a lot of work before she'll have a version of her skin to test on patients. But with all the progress she's making, it seems that day might not be far off.